Experience. Innovation. Determination. 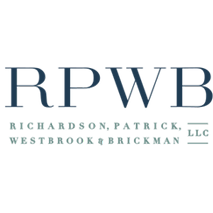 At Richardson, Patrick, Westbrook & Brickman, LLC, these are the qualities that set our firm apart. Our attorneys have a reputation for providing skilled, tenacious legal representation. We use a combination of innovative and tried-and-true legal strategies to protect our clients rights and interests.